UNITED NATIONS, August 10 -- The degree of collusion, if not to say outright corruption, between UN officials and the Correspondents Association which ostensibly cover them was shown again today. After a week in which June 24 questions by Inner City Press for UN Peacekeeping chief Herve Ladsous about the UN Mine Action Service's Somalia boss David Bax sharing genetic information from bombings with US authorities were spoon-fed to another media, on Saturday Inner City Press published the first in a series on Ladsous' tenure at the UN, here. Inner City Press also on Saturday published an initial curtain-raiser for the UN's so-called "Stress Test" of its problem-plagued UN TV and MAMS audio - visual system, embedding complaints that have been raised, here. Hours later, a social media account associated with UNCA came to the defense of Ladsous and his lapdog -- anonymously, of course. Since Inner City Press quit UNCA, which through first vice president Louis Charbonneau of Reuters demonstrably spied for the UN, handing internal anti-Press UNCA documents to the UN's Stephane Dujarric, here, and co-founded the Free UN Coalition for Access in December 2012, this has been going on. The anonymous trolling was raised to Reuters big wigs including Stephen J. Adler, and its former social media editor, now with Circa. Inner City Press and FUNCA have no problems responding to critical questions online -- Inner City Press did so, regarding the Democratic Republic of the Congo, earlier on Saturday afternoon. But for big media from Reuters and CBS News for to be associated with ANONYMOUS trolling, is too much. 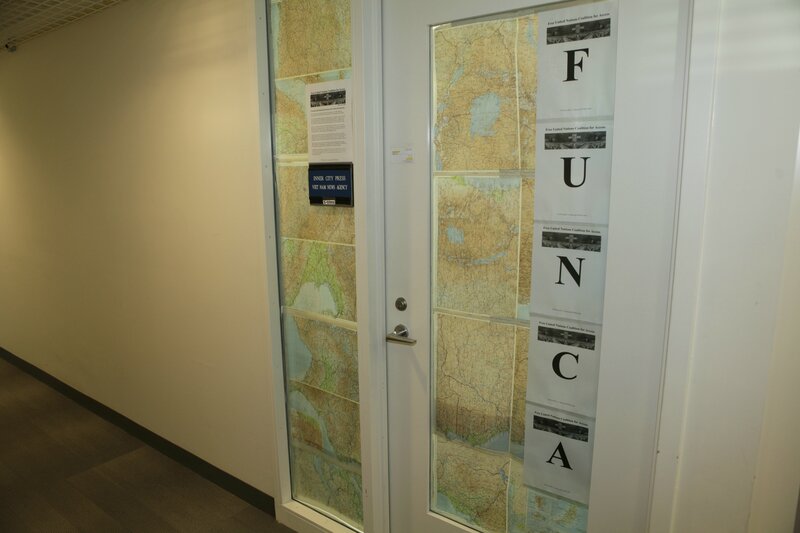 UNCA, in this the UN Cowardice Association, already got DPI through Dujarric to try to threaten Inner City Press' accreditation with suspension or withdrawal for hanging a sign of the Free UN Coalition for Access on the door of its shared office, while UNCA now has five signs. 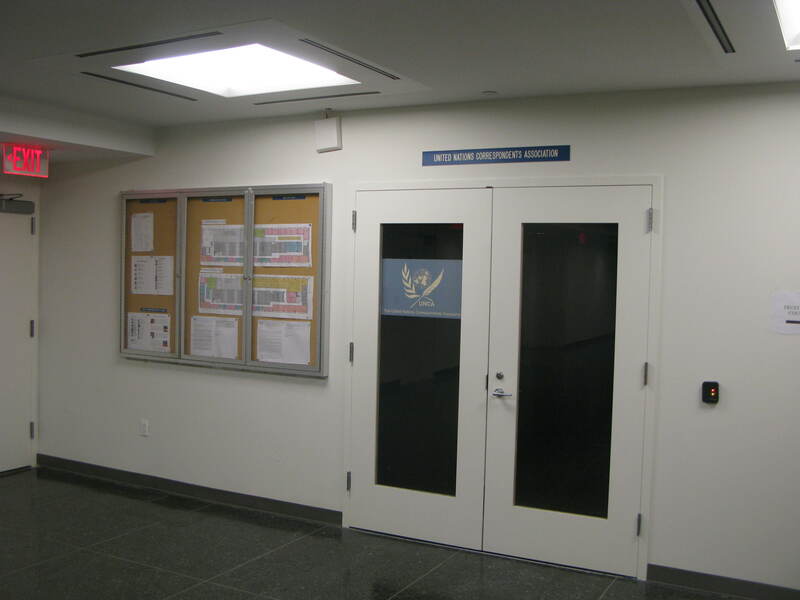 UNCA is given a big room in the UN, S-310, which it locks and uses for faux UN briefings, with the "Chefs to the Chefs" and the (Saudi-supported) Syrian opposition, promoted only to those which pay it money. Inner City Press' question about that at the UN's noon briefing have still not been answered. This too, now, is a conflict of interest. For months, Inner City Press and FUNCA have made all of these critiques on the record, in their names. The UN Cowardice Association, Ban Ki-moon's exclusive media partner, continues to take another, lower road. We'll have more on and about this. Watch this site.